Author's Note: Can be read as book three of the First Comes Love series, or as a standalone. I am at a loss for words. This is the first series that I’ve read in a very long time where book one, two, and three were all a HUGE FIVE stars for me! I loved the first book in the series, FIRST COMES LOVE, and raved about it when I was done. It was actually one of the very first contemporaries I've read. I wasn’t big on contemporary reads. My favorite type of books were always supernatural/paranormal. I gave this series a shot because I loved Katie Kacvinsky’s dystopian novels, and was familiar with her writing. I am so happy I did because this series will forever be one of my favorites and on the very top of my recommendation list. FIRST COMES LOVE was also the very first New Adult I've ever read. Originally it was labeled Young Adult since at that time the New Adult genre had not lifted off the ground yet. What I like, or should I say, ABSOLUTELY love about this series is all the emotions Gray and Dylan go through. How real it felt while reading. I got so lost in their emotions and fell so completely in love with the both of them... my poor little heart!! It definitely is one heck of a roller coaster ride. And the best part is that you can read each book as a standalone. I mean there will be a couple of questions here and there, but not enough to leave you confused and wanting more. Each book really is a brand new story with a complete ending. 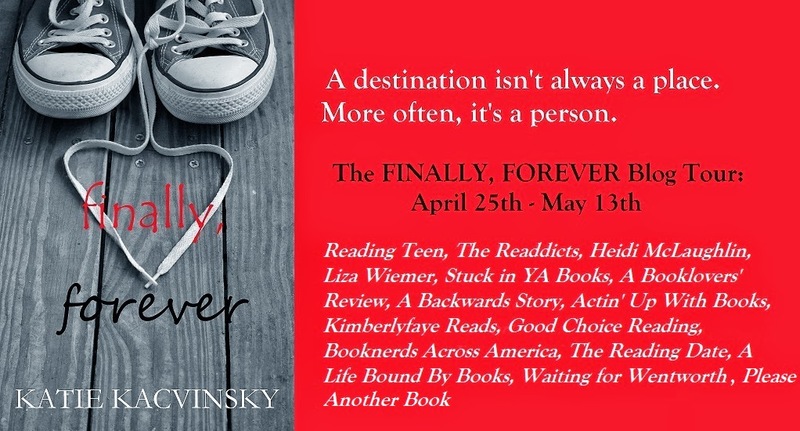 FINALLY, FOREVER is the third in the series and by far my favorite! I loved the first two, no, ADORED the first two in the series, but this one just really got to me. I cried, laughed, smiled from ear to ear… I basically went through every emotion someone in love goes through while reading this book. Katie Kacvinsky has written one of the best romantic couples ever. If you’re a new adult lover who is also a sucker for a good heart ripping story that leaves you happy in the end, DEFINITELY PICK THIS BOOK UP! You can start from the beginning with FIRST COMES LOVE, or just dive right into FINALLY, FOREVER. I love, love, love this series! I will forever be a fan of Katie Kacvinsky. I thought her dystopian series was amazing, but this just tops it all. Want to win a copy of the first and second book in the series, FIRST COMES LOVE & SECOND CHANCE? Sign-up for the Twitter Blast happening tomorrow Friday, May 9th - Release Day. Details can be found >> HERE <<. I absolutely LOVE this book. Like seriously ADORE <3 I'm so glad to hear that this one is your favorite! !